Was the car park of an apartment complex the reason for a triple murder, or were cars just a pretext for a hate crime? Michael Nam points to a parking space in the Finley Forest condominium complex in Chapel Hill, North Carolina. 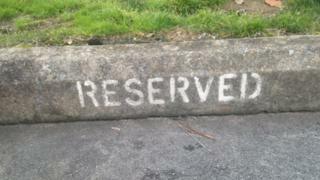 It doesn't look like much - a stretch of pavement and a stone marker with the word "reserved" in faded white letters. Two squashed pinecones are lying on the ground. It meant something to Craig Stephen Hicks, though. Once when Nam parked his car there, Hicks came out of his apartment with a gun holstered on his hip. It was at about four on a November afternoon. "I was like, 'Is this for real?'" Nam says. "I'm not afraid of your gun, but why the hell did you bring it out?" They argued over the parking space. Hicks, who is 46, took out his mobile phone and showed him a map of the condominium complex, pointing to the places where people are allowed to park - and which places are reserved. Finally Nam - more annoyed than scared - moved his car. Image caption The three victims: Deah Barakat, Yusor Mohammad Abu-Salha, Razan Mohammad Abu-Salha. "I'm like, 'You're a middle-aged guy, and you want to make it an issue,'" Nam says. "You be you." In the complex, each apartment gets a reserved space. But there are unreserved spaces throughout the car park and those who live in the complex can also park there. Residents often find that their reserved space is taken, so they park in an un-reserved one or in someone else's parking place. The system is chaotic and the source of many complaints. Residents say Hicks had two parking spaces he focused on in front of his apartment. Hicks' wife, Karen, was also vigilant. She'd come out of the apartment when she thought rules had been violated. "She'd say, 'You're not allowed to park here'," Nam says. Recalling these encounters with his neighbours, he glances over at the offending vehicle, a white 2007 Volvo. He is a graduate of the University of North Carolina with a degree in biology, and works at a local pharmacy as a technician. He lives in a tranquil place - at least most of the time. A pond is nearby with a wooden dock, and the air smells like pine needles. Two geese fly overhead. This week, though, the place has been anything but peaceful. On Tuesday afternoon, Deah Shaddy Barakat, 23, Yusor Mohammad Abu-Salha, 21, and her sister, Razan Mohammad Abu-Salha, 19, were shot dead. Barakat was studying dentistry at the graduate level at University of North Carolina. Razan Abu-Salha was a student at North Carolina State University. They were all shot in the head, and were found dead in their apartment. Hicks has been arrested. Afterwards a woman called 911 and described what she'd heard - terror and mayhem, followed by silence. "More than one girl screaming and then nothing," she told the police. "Then I heard more shots go off." As I was speaking to Nam on Wednesday afternoon, a helicopter hovers over the condominiums, momentarily drowning out his voice. Journalists from around the country, including me, have come here. They've also taken up most of the parking spaces. We are not all here to cover a story about an alleged parking dispute. Instead, the question is whether the killings were motivated by the victim's Muslim faith. It's also why the story has gotten so much attention on social media. No one doubts the horror of the incident on Tuesday afternoon. But if the victims were killed because of their religion, it becomes an "international" incident, as one journalist, a North Carolina reporter for the News & Observer, tells me. The chief of the Chapel Hill police, Chris Blue, issued a statement about the shootings: "We understand the concerns about the possibility that this was hate-motivated, and we will exhaust every lead to determine if that is the case." Karen Hicks is quick to say she and her husband were concerned about parking spaces, describing her married life to reporters in front of her lawyer's office in Chapel Hill on Wednesday. He is a "champion", she says, for the rights of individuals. Her eyes are filled with tears. She holds a piece of paper, a press statement, in front of her, and her hands are shaking. When asked to explain more about her husband's views, though, she looks confused. "It's almost like you have to be with him to understand," she says. "I know you can't just say, 'Trust me'" her voice trails off. A moment later, her lawyer, Robert Maitland, puts his hand on her shoulder. Her husband was studying to be a paralegal, she says. "He was unemployed," says Maitland after the press conference, speaking quietly to a reporter on the steps of his law firm. "He was 'the parking-lot guy' - you know the type. He would go around and check on parking spaces." But the father of the female victims is not convinced. "It was execution style, a bullet in every head," Mohammad Abu-Salha told the Charlotte News Observer. "This was not a dispute over a parking space; this was a hate crime. This man had picked on my daughter and her husband a couple of times before, and he talked with them with his gun in his belt. And they were uncomfortable with him, but they did not know he would go this far." The condominium complex, a place where graduate students and young families live, is located in a small college town. People here have plenty of stories about parking - and almost as many theories about what happened on Tuesday. Phil Varnadore, a University of Florida graduate, is walking two dogs, a husky named Chance and a mutt called Billy, near the pond. "We all have parking spots. You have a right to them," he says. But as he says: "Usually you call a tow truck before you commit murder." Still he downplays the idea of a hate crime, saying: "I don't think it made it easier to kill them because they were Muslim, black or whatever." Gina Rocket, who has lived there for the past year and a half, says she isn't sure about the motive. "I think it could be a combination - a hate crime that was also about parking." Late in the afternoon Nam gets ready to go inside his apartment. "I heard they were dental students," he says, explaining that he hopes someday to work as a pharmacist. "I was like, 'Man, they were so close.' I'm sure they had the same dreams I do - you want to go out and help people." Hicks is being held without bail, and a hearing is scheduled for 4 March.